GENEVA, November 30, 2015 – Despite prior promises by UNRWA, the Palestinian relief agency, to put an end to online incitement by its teachers, numerous UNRWA teachers are still inciting to Palestinian knife attacks against what they describe as “Jewish apes and pigs,” and should be fired, according to a new report issued today by UN Watch, the Geneva-based watchdog group. See full report below. “UNRWA’s reported temporary suspensions of offenders are clearly not working. Giving a slap on the wrist sends the message that it’s business as usual. Instead, those who incite to racism or murder should be fired, under a zero tolerance policy, just as the UK government recently banned a teacher from the classroom for life over an anti-Semitic Facebook post,” said Hillel Neuer, executive director of UN Watch. UN Watch submitted the report today to UN Secretary-General Ban Ki-moon, UNRWA chief Pierre Krähenbühl — as well as to EU foreign affairs commissioner Federica Mogherini, and U.S. Ambassador Samantha Power, whose governments are the top funders of UNRWA, for a combined total of almost $1 billion U.S. last year. Today’s report, coming after previous UN Watch reports this year on 22 other individuals, documents yet another 10 UN teachers, principals and other staffers who use the imprimatur of their official positions to incite Palestinian stabbing and shooting attacks against Israeli Jews. “The UN and top funders of UNRWA such as the United States government must act immediately to terminate employees who are inciting murderous anti-Semitism and fueling the deadly pandemic of Palestinian attacks against Israeli Jews that have claimed the lives of innocent men, women and children,” said Neuer. “UNRWA’s strategy of impunity, denial and deflection only enables more incitement and violence. It’s time to put an end to the pattern and practice of UNRWA school principals, teachers and staff members posting antisemitic and terror-inciting images, a recurring theme that suggests a pathology of racism and violence within UNRWA, one that must be rooted out — and not buried, as UNRWA spokesman Chris Gunness has attempted to do by calling for boycotts of newspapers or of NGOs that dare to report these incidents of hate,” said Neuer. “We’re urging the UN to declare unequivocally that these despicable posts, published on Facebook accounts run by people who openly identify themselves as UNRWA officials, constitute a gross violation of UNRWA Staff Regulations, and of the International Covenant on Civil and Political Rights, which prohibits incitement to discrimination, hostility or violence,” said Neuer. “UN Watch makes a fool of itself … Credibility dead in water. Will anyone believe them again”? This is one of numerous examples of violent incitement on Mr. Jowhary’s Facebook timeline, as well as posts that use Jihadist language to describe those attacking Israelis as victims and sacred martyrs. Yet despite hi s long record of inciting to violence, UNRWA school principal Abo Allaith Seafan (seen in photo, right) — whose own Facebook timeline includes graphic scenes of blood-splattered bodies, violence, and incitement — recently presented Mr. Jowhary with a special coaching certificate from the Toronto-based organization Right to Play, which is supposed to use sports to teach peace. Likewise, UN Watch calls on the British Council, sponsor in Jordan of the World Voice Programme, and Artistic Director Richard Frostick (seen below with Mr. Jowhary on November 12, 2015, in a seminar at the Millenium Hotel in Amman) to revoke his certificate as an “Ambassador for the World Voice Programme,” due to the UNRWA teacher’s engagement in incitement to murder. Recommendation: UNRWA should fire Mohammed Al Jowhary for using the name of UNRWA on an account which incites acts of terrorism, in gross violation of UNRWA Staff Rule 1.4. Right to Play, and the British Council’s World Voice Programme, should both revoke their certificates to Mr. Jowhary. Mazen Abo Hady, identifying himself on his Facebook profile as an UNRWA teacher in Gaza, engages in virulent incitement to murder Jews. On October 10th, Abo Hady posted the image below — also posted by fellow UNRWA employee Hiba Maria, as detailed in a previous report by UN Watch — which shows a keffiyeh-clad Palestinian playing a knife like a violin, using a Palestinian ‘key of return’ as a bow. It gets worse. On October 13th, the day when Palestinians carried out four separate terrorist attacks against Israelis — including an attack on a Jerusalem bus, and a car-ramming followed by murder with a meat cleaver, attacks which killed Haviv Haim, 78, and Rabbi Yeshayahu Krishevski, 60 — UNRWA teacher Abo Hady rushed to celebrate their deaths. Third, by celebrating the murder of Rabbi Krishevski and posting his photo, together with a keffiyeh-wearing man tearing through an Israeli flag with a bloodied knife, to reveal a scene in which the Palestinian flag flies atop the Al-Aqsa Mosque. Click here and here to see the original posts. Recommendation: UNRWA should fire teacher Mazen Abo Hady for using the name of UNRWA on an account that glorifies violent acts of terrorism, celebrates the murderers, and mocks the murder of innocents, all in gross violation of UNRWA Staff Rule 1.4. Recommendation: UNRWA should fire Suad Assi for inciting to anti-Semitism and terrorism, in gross violation of UNRWA Staff Rule 1.4. On the same day, she also published the post below exalting armed struggle, saying “Existence is Resistance.” A keffiyeh in the shape of the entirety of Israel and the Palestinian Territories accompanies text in which Palestinian fighters are lauded as paradigms of heroism. 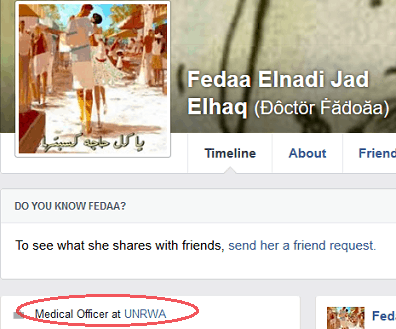 Recommendation: UNRWA should fire Dr. Fedaa Elhaq for using the name of UNRWA on an account that promotes violence, in gross violation of UNRWA Staff Rule 1.4. Recommendation: UNRWA should fire Bahaa Abel El Jawwad for using the name of UNRWA on an account that promotes violence and contravenes his obligation to be neutral, in gross violation of UNRWA Staff Rule 1.4. 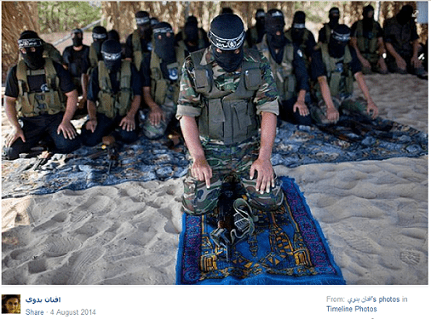 Afnan Badawi, who identifies herself on her Facebook page as a teacher at UNRWA, has since August 2014 had as her cover photo an image of masked Palestinians rocking a burning skip in 2014’s ‘Day of Anger.’ Below is a photo that she published to her account in August 2014, in which members of Hamas’s military wing, the Al-Qassam Brigades, pray next to their guns. Recommendation: UNRWA should fire Afnan Badawi for using the name of UNRWA on an account which condones violence and contravenes her obligation to be neutral, in gross violation of UNRWA Staff Rule 1.4. An unnamed UNRWA employee, whose Facebook account is under the name ‘Mother Palestine’ (see above), responded to the explosion in terrorism that has rocked Israel over the past month by posting inflammatory content condoning the violence. Below is a photo, taken on and uploaded from the individual’s mobile phone, of two masked individuals armed with a large knife (held as if in preparation to stab) and a gun, respectively. 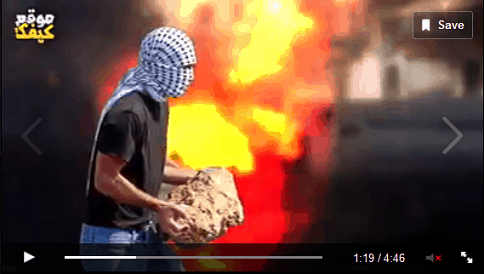 ‘Mother Palestine’ also posted a propaganda video on Facebook in which an array of belligerent acts are set to music. Below are two still images from the video. 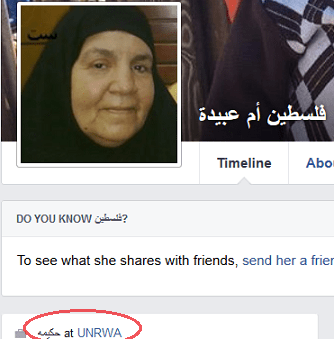 Recommendation: UNRWA should fire this employee for using the name of UNRWA on an account that promotes violence and celebrates violence and terrorism, in gross violation of UNRWA Staff Rule 1.4. 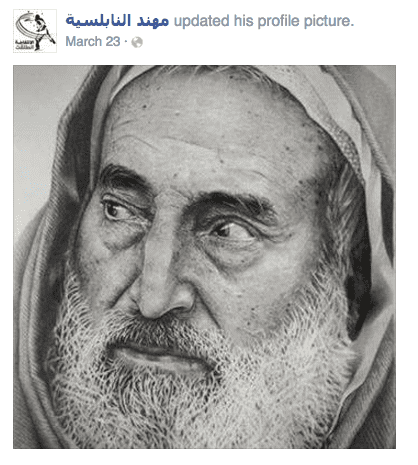 This time last year, Nabulsih posted the photograph below of Muataz Hijazi, the Islamic Jihad terrorist who shot Rabbi Yehuda Glick, the well-known Israeli activist for Jewish prayer rights on Temple Mount, on October 29, 2014, and who was himself shot dead in the aftermath. 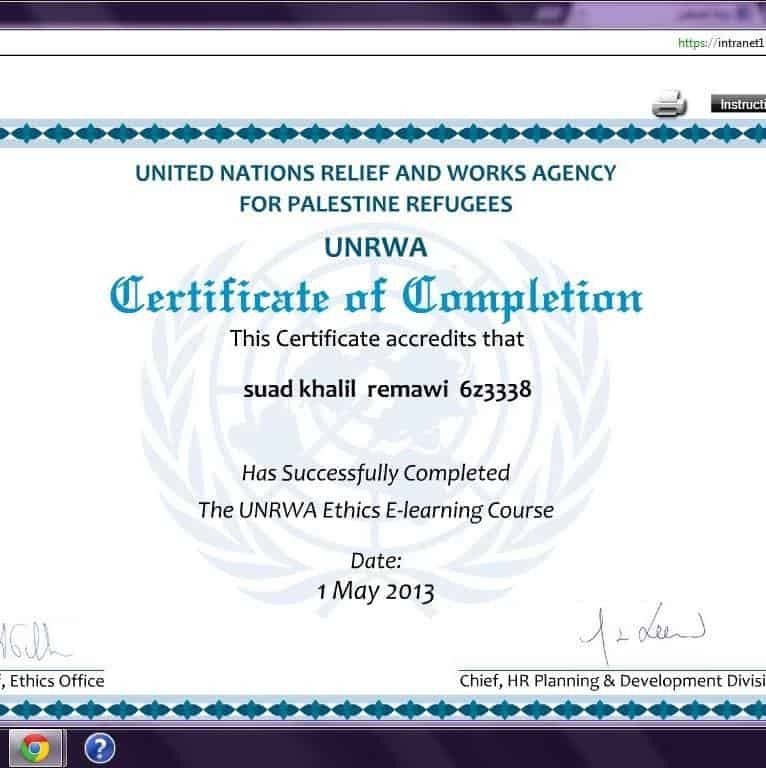 Recommendation: UNRWA should fire Muhammad Nabulsih for using the name of UNRWA on an account which celebrates violence and terrorism, in gross violation of UNRWA Staff Rule 1.4. Ruad Hussein, who identifies himself on his Facebook profile (above) as an UNRWA employee, shared two inflammatory posts below on his Facebook Timeline on October 10th, in the midst of the current Palestinian attacks on Jews. The original posts can be seen here and here. Recommendation: UNRWA should fire Ruad Hussein for using the name of UNRWA on an account that promotes violence and contravenes his obligation to be neutral, in gross violation of UNRWA Staff Rule 1.4. Recommendation: UNRWA should fire Mohammad Abu Musa for using the name of UNRWA on an account which promotes violence and contravenes his obligation of neutrality, in gross violation of UNRWA Staff Rule 1.4.